This entry was posted on Thursday, October 6th, 2011 at 16:36 and is filed under Election 2012, GOP Candidates, News, Politics, Sarah Palin. Since yesterday’s announcement on the Mark Levin show, there has been a good deal of discussion over what sort of role Governor Palin will play going forward. As ever, that decision is entirely up to her, and if it’s to be as an outsider, participating in a grass-roots charge as one of our decidedly stronger voices, I will satisfy myself with that. I realize that by supporting her in that end, it doesn’t mean I will always agree with her on every issue or every race, but because she’s been such a powerfully consistent voice, I will always tend to give her opinion more weight than those of most others. For the same reasons that she has said about how this will ultimately unshackle her, what Sarah Palin has done also liberates me. My goal now turns to one not at all dis-similar from what Sarah Palin has offered: I am and always have been most interested in restoring our nation, and indeed, it has been her devotion to that goal that attracted me to Governor Palin. As she embarks again on this unconventional form of battle, where she seeks political results without seeking political office, I still see in her a force for an amazing potential benefit to our nation, and frankly, given the way things have been going, we need every ally in the struggle we can find. Sarah Palin remains one of the most powerful advocates we will find. One of the points Governor Palin has repeatedly made is that one can be a powerful voice without seeking high office in large measure because it is liberating to take one’s message to the people without the constraints within which a candidate must frequently live. I understand this sentiment too, because frankly, now that Governor Palin isn’t going to run, I feel more at ease speaking frankly about my positions on various issues knowing that nobody will try to paint her with my views on issues by the mere association of my support for her. You’ve seen this done to candidates before: The media finds one supporter who holds a particular position, and the media goes through twist of knives and leaps of logic to associate the candidates with those views. Yes, it’s entirely unfair, but as you and I both know, the media is scarcely concerned with fairness. Let me give you an example: I am of the view that Barack Obama’s actions on a variety of issues makes him eligible to impeachment, but I would not want to state that position so bluntly if Sarah Palin had decided to enter the race, not because I believe it any less, but because I know how the ideas of supporters are frequently turned upon the candidates they support as if it had been the candidate’s own position. It happens constantly, and I didn’t wish to cause Governor Palin that kind of grief, whether she agreed in principle with my thinking or not. Why wouldn’t you say it if you believe it? The answer is simply that we have a large segment of people eligible to vote who might be fence-sitters, or less than clear on the issues at hand, and might be driven off by what the media will inevitably paint as a “fringe idea.” That’s a minefield into which Michele Bachmann has now repeatedly blundered. It makes great stump speech red meat, but in truth it tends to hurt more than it helps in our current media environment. Now Sarah Palin is unshackled, but guess what? So are you and I. I have no intention of jumping on any bandwagon of any of the remaining candidates precisely because I want to see what happens going forward with each of them. I supported a Sarah Palin candidacy because I had agreed with enough of her core principles that she was an excellent representative of my beliefs, and I haven’t gone elsewhere because I’m waiting for some indication that one of these candidates will meet the same criteria, but to simply turn my support on the spur of the moment because Palin is not running would be to betray the ideals she had repeatedly explained about her views and positions on how we must thoroughly inspect and vet each of these candidates. I agree with that sentiment, and I will continue to do so. I’m not inclined at this point to throw my support behind any of them, each having demonstrated sufficient reasons for caution. Instead, I’m going to keep my powder dry, no longer in expectation of a Pain candidacy, but instead because when the time comes for me to choose, since I believe it will be among lesser candidates than the one I’d have chosen, I need to exercise more care and caution in making my final choice. That’s how I view this, and as I enter my fortieth consecutive hour without sleep, I suppose I shall leave it there, but tomorrow, expect to read a bit more about some of the ideas I’ll be discussing with the goal of restoring our nation firmly in mind. No one comes close to being the true voice of the conservative movement like Sarah Palin, I thank God for her. I will be looking forward to reading more of your ideas and hope you are able to get some sleep. Good post – especially for one who is sleepless in……. Amazing – I knew we agreed on much, yet I had never thought to mention or ask you about the question of impeachment – for I believe as you do. I am also a realist – and cannot imagine any way it could even get off the ground, with our media and the current Senate make-up, not to mention the many weak-kneed Repubs in the House. I also concur with you regarding the other candidates for President. My only choice is no longer available to me……and, with what I have known of the records of the candidates remaining, I am not prepared to even lean in any direction. My biggest fear right now is that we could end up with a "less than conservative" candidate who will not work to do much of what I believe needs doing. Thanks Mark. Your words and ideas continue to inspire. I look forward to reading your thoughts and ideas. Hi Mark, just wanted to say how much I've enjoyed following your blog and thanks for the recent improvement of not having to sign in to read! I completely understand your pain and sleeplessness. I've been restless myself recently and now feel like I know why! I must have sensed she was not going to run…and although I understand the many reasons why she felt this was best, it doesn't make it any less disappointing. That said, I'm interested in continuing to read what you have to say and hope the wind wasn't totally taken out of your sails! I too did not sleep well if but a hr of fitful sleep. I am going to take my time listening and watching each candidate and how they conduct themselves. There is still plenty of time for anyone of them to hang themselves. I do not want to be dangling with them. Like you I will make no hasty decision. I wish we had the time to counter-protest the sheeple that the left wing has activated, but nearly all conservatives have jobs that keep them busy 40 – 80 hours a week. Oh, to dream of the opportunity to present the truth to them every time they start regurgitating the lies they have been led to believe. It would be hard, but a challenge that I would enjoy attempting. I am a lot more tolerant of stupidity than most, but I am sure that my patience would be tested to the fullest extent of my being and maybe beyond. But still….., it would be worth trying. I agree that we need to be cautious and weigh all candidates and what they say. It has been a disappointing experience to come to the realization that we will not be carrying the Palin banners and rejoicing on election night when we hear her name announced as president. I think many of us have been living for that moment and I, for one, felt sure that she would run and make it to that moment. However, we find ourselves at another junction on our journey and must commit to a new plan. Ms. Palin is still my leader and I know she is confident that she is doing the right and necessary thing in not running. Last night, I wept because I thought our hope to defeat Obama was gone. I think we all want to see this man defeated so much that we feel like marching to Washington ourselves. I know I do. Sarah has not ceased marching to Washington…..she's just doing it in a way that is not recognizable to us and in a way that will affect the right change. She is free and we are too. I like that! Mark, you expressed it so well in your comments. So, let's take a fresh look at our journey plans and follow Sarah's lead. We can accomplish great things for America by staying vigilant, passionate, and faithful to the principles and ideals that Ms. Palin stands for. May God bless Ms. Palin and her family and light her way!!! Mark, I for one intend to continue reading your very thoughtful blog. And any suggestions regarding whom to support would be gratefully received. I've been spoiled by Sarah Palin. She has everything I've been looking for in a president. And frankly, the remaining candidates are all frightfully short in both foreign affairs and national defense. These are two vital areas that are under the president's direct control. There is no constitutional question here at all. Moreover, because of the importance of highly-classified intelligence information, they are areas in which voters are necessarily in the dark. We can only elect someone hoping he or she will excercise good judgment. And B. Hussein Obama is in the process of truly gutting our Armed Forces. Herman Cain will be 66 years old in a few months. If he were bright, he'd choose Governor Palin as his running mate. He might not be up to more than one term, and she would make the perfect follow-on. Any other pairing (Palin with any of the others) doesn't really cut it for me. Her support would quickly push him into the lead for the nomination. So, are you telling me that one of the current candidates Palin thinks we should support? None of them are worthy in my estimation – None! Each one is either tied to the GOP cocktail establishment or they don't even have the energy to animate the voting public like Palin had but threw away. Or are you telling me that there is a candidate who has not declared, who has no organization set up, and the date for primary signup is very near??? I am not meaning to be combative, but I fear Palin has done too much damage already. Thanks for the post Mark, you are a good man. I think we all know how you feel, we all did not imagine that she was running but I sure didn't think she would settle for the cheerleader, who knew? I sure didn't, but what are you going to do. We will move on and fight the fight. Thank you for what you do, God bless you. I commented on 10/5/11 about Sarah getting her ducks lined up-Senate-Congress and a benchwarmer. Like you (Mark & others) I've lost sleep over this. Can Sarah stay home with the family and keep making MOOSE CHILI while conducting an orchestra to have all the right people (or most) in the right position to turn this country around ?? Will Sarah take a VP slot if asked ??? Smart move-why not ?? Sarah keeps the wolfs at bay for 11 plus months, rebuilds whatever has to be rebuilt, tells GOD "We have to have another talk" then tells the family that God said "Do what you were born to do" Sarah is a leader and if your not the lead dog "The view never changes" Give her the keys to get this car out of the ditch. I believe it's a CAN'T LOSE opportunity for Sarah. The VP slot will put her all over the world-experience she will need. Keep up the good work Mark-this isn't over !!!!!!!!!! Very well written Mark. My second time here and first after subscribing. I understand your point perfectly and agree. I admit I haven't been totally committed to a Palin presidential run as I saw the shape of the fight against her and believed from very early on that she would be a larger force in the fight to take America back as a free agent, so to speak. I am very happy she has chosen that path. I recall the ascendency of Reagan and truly believe that he was better prepared to be president by all the work he did in hollywood against the communists and later his involvement with the Goldwater campaign, not even counting being Govenor, but it had to help. He came into his own, articulated who he was and what he believed so very well, that I think many are very glad that he became our president. I truly hope our Republic will again be in very capable hands and I think Sarah Palin can aspire to that. In my heart, I believe that Sarah is so humble and such a conscientious person that she may have felt she didn't KNOW enough about foreign affairs and/or the military to be ready for the presidency. Maybe she feels she needs time to prepare for those areas of governing this country. I know that these other candidates aren't prepared enough either. In 2008, this country elected a man who was totally deficient in qualifications to govern America. He's still quite deficient. Totally inept. Ms. Palin is the kind of person who expects much from herself. I identify with that as a former teacher. Whenever I was given a new subject to teach, I worked long hours to prepare and be the best that I could be to teach my students. I believe Sarah is so very ready in domestic ways, but she probably needs time to really become prepared for foreign affairs. This is not to say that she isn't the most qualified among the folks that are running right now. She is the MOSt qualified and I will have a difficult time casting my vote for any of those running for the GOP nomination right now. All I see that we can do is pray pray pray that God will direct Ms. Palin and raise her up in His timing and in His perfect plan. If one is not a strong believer that God controls everything on this earth, then one will not understand how to pray or how to discern the truth. Ms. Palin can work very hard doing what she knows best to do right now. She is eager, I believe, to learn more about foreign affairs and I think she is studying studying studying right now. I am convinced that Ms. Palin desires to become the BEST she can become before she takes on the challenge of governing America. Until she is satisfied with her foundations, she is willing to support someone else as best she can. I think that is admirable. However, she may come to understand that in spite of areas where she feels she needs stronger preparation, she is still the BEST person for the job of presidency. She will have to come to that knowledge on her own. In the meantime, she will certainly grow and become more grounded in her knowledge. It is inspiring to watch her energize others! And thank God she has a very supportive husband and family. That is highly important! She can run circles around anybody out there right now, but that is not enough for her right now. She is preparing and studying and listening to God. When the time is right and the conditions are right, she will KNOW that! This is my opinion. I know folks may or may not agree. That is just fine with me. I believe that we will be able to get Obama out of office. I believe that Ms. Palin believes that also. Let's not be afraid. It serves no purpose. There was Ronald Reagan. There was Sarah Palin. There was noone in-between, and noone since. Everything will be ok Bill. The world will still turn…. Read about the candidates and find one with similar values and ideals. 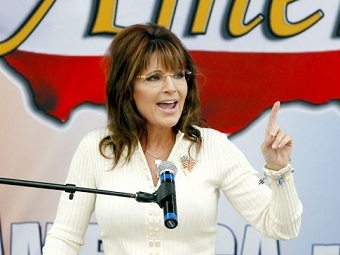 Sarah Palin will be around for time to come, helping to keep the candidates on the straight and narrow.